Or I could call this post, How “Mad Men” Saved Cocktails. But first, let me welcome back everyone to the HUNGRY HEARTS HOLIDAY HOP where we’re celebrating the New Year with mouthwatering dips, appetizers, and drink recipes and delicious EXCERPTS from today’s hottest food-loving ROMANCE writers! Again, hop around each author’s site for a new recipe, and fill out the Rafflecopter form to enter our GIVEAWAY: an Amazon, Barnes & Noble, or Book Depository GIFT CARD! Additionally, Amanda Usen will be featuring Hungry Hearts authors on Writer.Chef.Romantic and gifting their books to lucky winners. Stay tuned to get in on the fun! If you’d like to party in real time, please join our Facebook Party December 26th – January 1st. Okay, now back to our regularly schedule program. 🙂 So, truth be told, cocktails are like good food to me. They are special treats that come from a creative spark and are meant to be savored. I don’t drink much, but when I’m in the mood for a special treat, I’ll make a cocktail. There’s something magical about them, and since a foodie made me my first one (a vodka gimlet in a martini glass when I was 21), I fell in love with the history, mixology, the presentation, and the glassware (oh don’t even get me started there). Where does “Mad Men” come in? 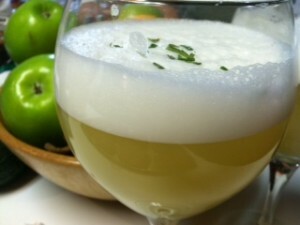 Well, before the TV show made such an impact on bringing back old trends and fashions, I didn’t find a lot of elegant cocktails in restaurants. It was pretty much martini, pina colada, margarita, whiskey sour. Well, you get the idea. Then “Mad Men” came along, and restaurants (the nice ones) started researching cocktails from the past. And that’s how I found the one I’m going to talk about today for our Hungry Hearts Holiday Hop: The Boris Karloff. Yes, it’s named after the actor who played Dracula. He was also in “Arsenic and Old Lace” (and it was when he was playing his role on Broadway that a NY bartender ended up making this drink up). My favorite local restaurant is known for its cocktails, and I got to know the bartender there. Well, one night, he asked me what I wanted, and like usual I said, “Surprise me.” He dug out his special black book (yes they have them, and I think it’s the coolest thing ever). Moments later, he set this daring egg white concoction in front of me. Yes, egg whites. And don’t worry, there’s nothing to be afraid of. The citrus in the drink “cures” the raw ingredients (just like it does with ceviche). And it’s delicious. 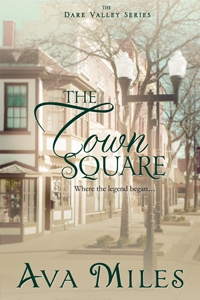 This love of “Mad Men” worked beautifully in informing my newest release, THE TOWN SQUARE, which I call my ode to “Mad Men” in a small town with a happy ending. People loved the grandpa, Arthur Hale, in my series, and they begged for his story. I wanted to know too, so I wrote it. It’s set in 1960, and not surprisingly, talks about the fashions and culture of the time. Of course, my hero drinks Manhattans. I don’t think he would have been able to order a Boris Karloff in Dare Valley, Colorado. I can’t imagine anyone making a drink with egg whites in the local diner they frequent. 🙂 Arthur even jokes that the Manhattans aren’t as good in Dare as they were in New York City (no surprise there). He should come to my house. I’m known for my cocktails amongst friends and family. My sisters are even spreading the tradition of The Boris Karloff far and wide as well. We’ll be having them for Christmas and New Year’s no doubt. Heck, we had them at Thanksgiving. They’re just that special. Well, let’s get onto the recipe, shall we? Drum roll please. Now, here’s the trick to making it. Shake all of these ingredients together first and then add the ice and shake again (you want to have the egg whites expand before they are cooled with the ice). You will have a nice foamy top. Pour into a lovely glass. Add a dash of sparkling water. Now, here’s my recent daring addition (because that’s how I roll cooking wise). Dice up some fresh rosemary and sprinkle on the top. It was heavenly. But you can leave it plain if you want. It’s superb either way. Whatever you plan on celebrating with, on New Year’s Eve, I’ll be raising my glass to all of you and being grateful for your presence in my life and looking forward to much more fun in the coming year. I would love to get back on track with loosing weight and saving up some money for a down payment on a house! I must increase my calorie output since I’ve never been good at limitimg my calorie intake! And what better way to work off those holiday cookies… well, what better way *outside* the bedroom! Have a good time with family and friends all year long! I am not much of a cocktail drinker; but the recipe does sound delicious. I don’t make new year resolutions but because I usually don’t keep them. However, I will be trying to watch more carefully what I am eating in 2014. Not because of weight but cholesterol. Sigh – it’s a genetics thing. I just plan to accept things as they come. I do not do resolutions. I actually love Amaretto Sours. My resolution is this-for every 10 paperback books (of romance and mysteries) I plan to read a classic. This was my resolution last year and I read some of the classics I didn’t get to read in high school or college. i discovered some pretty fine literature is out there. For the first time I kept track of how many books I read this year and I’m on my 40th. My resolution would be to try and double that. I know it depends on the size of book though lol. I don’t really do resolutions but my goal for the year is to learn something new, go somewhere new and make one new friend. I’ve done that for several years and it makes looking forward so much more exciting! Oh, and I’ll drink anything with Bailey’s in it! Cheers! I lost over 20lb last yr Jan-June and gained it back July-now. I want to get back there. Your Boris sounds lovely, but I’d still take my Golden Cadillac if I weren’t counting calories. Instead, I’ll probably celebrate the new year with a nice, relatively low calorie glass of white wine. This sounds great! I’m definitely going to have to try it! My goals would be to reduce debt & reduce my waistline! Every year I have the same resolution but so far I have not succeeded in meeting my goal. I seriously need to lose weight and Im really hoping I can attain this goal this year.